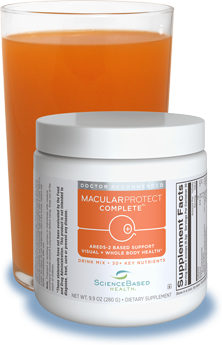 MacularProtect Complete AREDS2 Drink Mix is a convenient, all-in-one formula providing powerful support for macular & whole body health. It offers nutrients at levels found to promote healthy vision in the AREDS & AREDS 2 clinical trials – such as 10 mg lutein, as well as over 30 other key ingredients. Easy-to-swallow drink mix in tasty, all-natural orange flavor! Made from premium ingredients in NSF-Certified facilities. Recommended dose: one scoop mixed in a 1/2 cup (4 oz.) or more of water, twice daily. View the MacularProtect Complete AREDS2 Drink Mix Spec Sheet. New! Tasty drink mix with natural mango lemonade flavor. Suggested Use: Mix one scoop with 1 cup (8 fl. oz) of water and stir vigorously. Store in a cool, dry place; do not refrigerate. Use a dry scoop, and replace cap tightly immediately after use. Note: There are minor differences between the drink mix and capsule formulas to optimize drink mix taste and solubility. View differences.